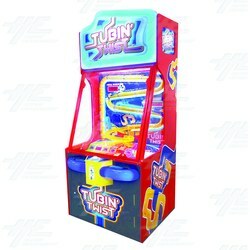 The Tubin' Twist from UNIS is a ticket redemption game that is all about hand-eye co-ordination and timing. Time the drop of the ball and stop the spinner to win tickets. Players press the button to release ball at the top, and watch it as the ball falls through a series of tubes. Then control the stop of the spinner by pressing the button again, the ball drops onto the spinner then down into a numbered slot to win a corresponding number of tickets. Players press the button to release ball at the top, and watch it as the ball falls through a series of tubes. Then control the stop of the spinner by pressing the button again, the ball drops onto the spinner then down into a numbered slot to win a corresponding number of tickets. An attractive game to fill your cashbox! 100% skill-based game with high odds of winning Giant Bonus!